In this week's show, Kathy Werling tells us about her recent cruise on the Disney Wonder - Kevin Klose has 're-reviews' of Villa de Flora at the Gaylord Palms, the Yachtsman Steak House at Disney's Yacht and Beach Club and some suggestions for 'cheap eats' around the Disney area. All that plus this week's news and Roundtable rapid-fire on this edition of the DIS Unplugged. In this week's show, Kathy Werling tells us about the annual passholder preview of the upcoming "American Idol Experience" at Disney's Hollywood Studios. The team talks about MouseFest and our Toy Story Mania party. All that plus Roundtable rapid-fire and this week's news on this edition of the DIS Unplugged. In this week's show, Pete Werner has a review of "Breakfast with the Grinch" at Islands of Adventure theme park in the Universal Orlando Resort. Kathy Werling tells us about her experience at the Christmas parade taping at the Magic Kingdom. All that plus this week's news and Roundtable rapid-fire on this edition of the DIS Unplugged. In this week's show the team is on location at the Walt Disney World Swan & Dolphin Resorts. We'll talk with the resorts Sales & Marketing Director, Eric Opron who tells us about what's happening at the Swan/Dolphin for the holidays and what's coming up for next year. He's also giving a very special exclusive offer to DIS Unplugged listeners (you have to listen to find out what it is :) ). Teresa Echols tells us about her 6 year old daughter Stella's visit to the Camp Dolphin child care center. Kevin Klose has his review of the new Contempo Cafe at the Contemporary - all that plus this week's news and Roundtable rapid-fire. In this week's show, Kathy Werling tells us about her recent stay at the Disney's All Star Music Resort in one of the Family Suites. Kevin Klose has a review of an off-property dining option, the Stonewood Grill and Tavern. All that plus this week's news and Roundtable rapid-fire on this edition of the DIS Unplugged. AirTran and Delta to impose first checked bag fee for M.E. In this week's show, Corene Fry, an animal expert and behavioral specialist, gives us tips and information on what to do with your pets while on vacation, including some of the emotions they go through. Some of the DIS team had the opportunity to see ICE at Gaylord Palms, so we'll tell you about our "cool" experience. All that plus this week's news and Roundtable rapid-fire on this edition of the DIS Unplugged. In this week's show, Teresa Echols gives her experience with children of the new T-Rex restaurant at Downtown Disney. John Magi tells us about the new "buy four nights, get three free" Disney Package offer that was recently released - Pete has a rant. Kevin Klose has a review of a cheap off-property dining option, the Pei Wei Asian Diner. All that plus this week's news and Roundtable rapid-fire on this edition of the DIS Unplugged. BUY 4 NIGHTS, GET 3 FREE!! In this week's show, Julie Martin has her last Store Tour of the Disneyland Resort in California and tells us about all the shops at Downtown Disney. 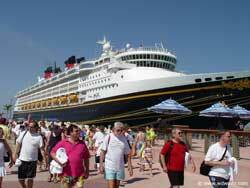 John Magi tells us about some of the current Disney Cruise Line discounts being offered. All that plus this week's news and Roundtable rapid-fire on this edition of the DIS Unplugged. In this week's show, Teresa Echols tells us about the new Pixie Hollow area in Toontown at the Magic Kingdom. Kevin Klose has his review of Jiko at Animal Kingdom Lodge along with the winners of the "Review a Restaurant with Kevin" contest. All that plus this week's news and Roundtable rapid-fire on this edition of the DIS Unplugged. In this week's show, Pete Werner is back and has a few announcements, including our plans for our MouseFest Meet in December. One our listeners, Christopher Wing, sends in a review of the Undiscovered Future World Tour at Epcot. 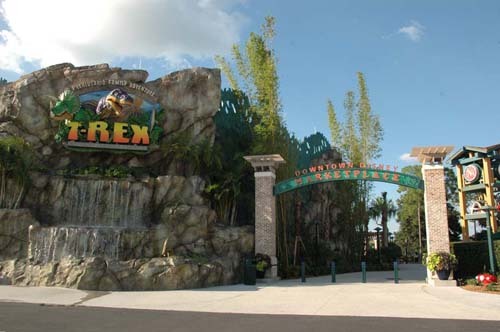 Kevin Klose has his review of the newly opened T-Rex restaurant at Downtown Disney. All that plus Roundtable rapid-fire and the news on this week's edition of the DIS Unplugged. In this week's show, Kevin Klose has his review of the newly opened Nine Dragons Restaurant in the China Pavilion at Epcot. In our forum watch segment, we'll tell you what threads we found interesting on DISBoards.com. Teresa Echols gives a first timer's point of view of the Food and Wine Festival and Halloween Horror Nights at Universal Orlando. All that plus Roundtable rapid-fire and the news on this week's edition of the DIS Unplugged. Why the hard ticket to all these special events? Which cruise will you book for Summer 2010? In this week's show, Julie Martin has a store tour of the Disneyland Theme Park in California. Kevin Klose and John Magi give us a review of the Party for Senses at Epcot's Food and Wine Festival. All that plus Roundtable rapid-fire and the news on this week's edition of the DIS Unplugged. Video Tutorials for the DIS! In this week's show, we talk briefly about the Food and Wine Festival, and Corey, Will and Kathy Werling tell us about their experience at Halloween Horror Nights at Universal Orlando. Kevin and John tell us about their recent Disney Cruise onboard the Disney Magic. Kathy also gives us an update on the renovated rooms at Caribbean Beach. All that plus Roundtable rapid-fire and the news on this week's edition of the DIS Unplugged. In this week's show, Julie has her Store Tour segment of Disney's California Adventure Theme Park. Kevin and John tell us about their recent tour of Bay Lake Tower at Disney's Contemporary Resort. John also has some Disney Cruise Line Rumors. All that plus Roundtable rapid-fire and the news on this week's edition of the DIS Unplugged. In this week's show, Regina Hinrichs joins us at the roundtable to talk about her 5-night Disney Cruise with over 250 DISers onboard. One of our newest members to the team, Teresa Echols, also joins us as we discuss Mickey's Not So Scary Halloween Party at the Magic Kingdom. One of our listeners calls in with a review of the Resort Photo Pass Private Sessions at the Grand Floridian. All that plus Roundtable rapid-fire and the news on this week's edition of the DIS Unplugged. In this week's show, Jason Klauber (AKA Jaypd on the boards) calls in with a new monthly segment called "Beyond the Parks". Our newest member to the DIS Team, Kathy Werling, has a review of Disney's Wilderness Lodge, and one of our listeners calls in with a review of Disneyland Paris. All that plus Roundtable rapid-fire and the news on this week's edition of the DIS Unplugged. In this week's show we'll tell you about our recent visit to the House of Blues Sunday Gospel Brunch - Julie Martin has her final installment in her "Disney Weddings" series, this week she talks about Disney Honeymoons. All that plus Roundtable rapid-fire and the news on this week's edition of the DIS Unplugged. In this week's show we'll discuss our recent visit to DisneyQuest at Downtown Disney. Kevin Klose reviews Artist Point at the Wilderness Lodge, as well as Captains Grille at the Yacht Club on this week's edition of the DIS Unplugged. In this week's show Pete Werner gives us some tips on How to beat the high cost of airfare. Julie Martin has her last installment of her Disney Weddings series. All that plus the news and Roundtable rapid-fire on this week's edition of the DIS Unplugged. In this week's show Pete Werner reviews Disney's Polynesian resort, with an added review of the Ohana character breakfast. Corey Martin and Will Perry do some virtual skydiving in the latest installment of Xtreme Orlando. All that plus the news and Roundtable rapid-fire on this week's edition of the DIS Unplugged. . In this week's show Julie and her little sister, Taylor Glass, tell us about their experience at the Grand Floridian Afternoon Tea at the Garden Lounge. We end our Christmas in July series with holiday events onboard the Disney Cruise Line, and we recap with our Christmas favorites. All that plus this week's news and Roundtable rapid-fire on this week's edition of the DIS Unplugged. In this week's show Kevin Klose has his review of Cinderella's Royal Table - and he enlisted the help of one of our listeners for it. In our ongoing Christmas in July series we'll talk about some of the holiday events at Disneyland in California. All that plus this week's news and Roundtable rapid-fire on this week's edition of the DIS Unplugged. In this week's show Will Perry and Walter Echols give their report on fishing excursions at Walt Disney World. We'll continue our Christmas in July series with a look at holiday events around the Walt Disney World resorts, and we also look at some holiday happenings at Universal Orlando as well. All that plus this week's news and Roundtable rapid-fire on this week's edition of the DIS Unplugged. In this week's show we'll talk to author and Disney blogger Kevin Yee from MiceAge.com as he shares his entertaining and unique perspective on all things Disney. In this week's Christmas in July series John Magi takes us thru all the major events that take place at Walt Disney World during the holiday season. All that plus this week's news, roundtable rapid-fire and a lot of prize give-away's! In this week's show we'll discuss the top news stories on the DIS including the story about Pleasure Island closing the clubs. Jane Cartelli, the founder of Gifts of a Lifetime, calls in to tell us about her event planning service. This show also kicks off Christmas in July. All that plus Roundtable rapid-fire on this week's edition of the DIS Unplugged. In this week's show we'll discuss the top news stories on the DIS including the story about Orlando getting a giant wheel. Corey Martin talks about the moderate resort pools on Disney property. Julie Martin gives us information about getting married on the Disney Cruise Line as part of her Disney wedding series. John Magi and Kevin Klose call in from their Royal Caribbean cruise vacation with an update. All that plus Roundtable rapid-fire on this week's edition of the DIS Unplugged. In this week's show we'll discuss the top news stories on the DIS. William Perry has a review of the Richard Petty Driving Experience at Walt Disney World, and John Magi gives us some tips on keeping cool while visiting the theme parks. All that plus Roundtable rapid-fire on this week's edition of the DIS Unplugged. In this week's show we'll discuss the top news stories on the DIS including the impact airline issues could have on Orlando. Kevin Klose has his review of the new Wave restaurant at Disney's Contemporary Resort. We all introduce a new segment - "Let's call and harass Regina". All that plus Roundtable rapid-fire on this week's edition of the DIS Unplugged. In this week's show we'll discuss the top news stories on the DIS including a report from the World Science Festival and the presentation from Disney Imagineering. Julie Martin brings us part two in her Disney wedding series and Kevin Klose reviews Restaurant Marrakesh at Epcot. In this week's show we'll discuss the top news stories on the DIS including the fine levied by OSHA against Disney for last years fatal accident on Primeval Whirl. The team discusses the opening of two new major attractions - The Simpsons Ride at Universal Studios and Toy Story Mania at Disney's Hollywood Studios. Also, Kevin Klose has his review of the Sand Trap Golf Club at the Osprey Ridge golf course. All that plus Roundtable rapid-fire on this week's edition of the DIS Unplugged. The "Bob" Memorial Show - the team shares stories about Bob Varley. The "Best of Bob" Show - our listeners pick their favorite Bob segments. In this week's show we discuss Disneyland and the California Food and Wine Festival after Pete and Walter's return from their working vacation to Southern California. This was also our last show with Bob Varley. In this week's show we discuss the top news stories on the DIS, including the DIS'er who won Disney's Chief Magical Official contest. Julie Martin has her first installment in her Disney Weddings series and John, Kevin and Bob talk about the 10th anniversary of Animal Kingdom. All that plus Roundtable rapid-fire on this week's edition of the DIS Unplugged. Like our Show? Leave a comment on iTunes. Hear Pete Werner discuss online travel tips with Peter Anthony Holder on radio station CFRB in Toronto and CJAD in Montreal. John Magi plays host this week while Pete Werner is in California on a working vacation. In this week's show we'll discuss the top news stories and hot topics on the DISboards, including the story about Disney shutting down VMK (Virtual Magic Kingdom). Bob Varley gives us some timely advice on what to do if your flight is delayed. Kevin Klose has his review of the Maya Grill at the Disney's Coronado Springs Resort. All that plus roundtable rapid-fire on this week's edition of the DIS Unplugged. This week's podcast covers the week's top news stories, including the price increase for Stroller and ECV Rentals. The team discusses the Free Dining Package promotion that Disney is currently offering. Bob Varley has his report on Pop Century from his two night stay. Corey & Julie Martin tell us about Aquatica, Sea World's new waterpark. All that plus roundtable rapid-fire on this week's edition of the DIS Unplugged. This week's podcast covers the week's top news stories, including the arrest of the Disney scam artist and Disney Cruise Line's contract with the Port Canaveral Authority. The team discusses Universal's "Hollywood Rip, Ride, Rockit" Coaster, Bob visits Epcot's International Flower and Garden Festival on opening day, Kevin reviews the Crystal Palace restaurant. All that plus Roundtable rapid-fire on this week's edition of the DIS Unplugged Roundtable. Our biggest prize give-a-way EVER!! We award the winners in our Photo Contest and we'll discuss the week's top news stories, including the report of how Orlando theme parks fared in 2007. Corey & Julie Martin have their review of the Port Orleans Riverside, and Julie does a Store Tour of both Port Orleans Resorts. All that plus Roundtable rapid-fire on this week's edition of the DIS Unplugged Roundtable. In this week's show we'll discuss the top news stories on the DIS including the story about Disney’s Grand Floridian Resort treated for mold, and Primeval Whirl at the Animal Kingdom ramping up safety features. Pete Werner has his review of the Contemporary Resort from his stay last week, and Bob Varley reports on ESPN The Weekend at Disney's Hollywood Studios. All that plus Roundtable rapid-fire on this week's edition of the DIS Unplugged Roundtable. In this week's show we'll discuss the top news stories on the DIS including the story about the con artist who is victimizing some Disney resort guests. We'll announce the winner of the "Review a Restaurant with Kevin" contest, and Kevin will have his latest dining review of Tony's Town Square restaurant. All that plus Roundtable rapid-fire (including an update on 'Chicken Gate') on this week's edition of the DIS Unplugged Roundtable. In this week's show we'll discuss the top news stories on the DIS including the story about the new plans for Disney's old treehouse villas. Corey Martin has his Disney College Program report and Julie Martin finishes her "Store Tours" of Epcot with a trip to Mexico. All that plus Roundtable rapid-fire and Cast Member appreciation on this edition of the DIS Unplugged. Treasures of the Vatican Feb 9 - May 11 at the Florida Museum in Tampa. Breakdown of Disney resort "seasons"
In this week's show we'll discuss the top news stories on the DIS including the story about the union protests at Disneyland last week. Kevin Klose has a new review of Boatrights Dining Hall at Port Orleans Riverside, and an update on his review of the Portobello Yacht Club at Downtown Disney. Pete Werner tells about some of the behind the scenes tours at Sea World. All that plus Roundtable rapid-fire on this week's edition of the DIS Unplugged! In this week's show we'll discuss the top news stories on the DIS including the story about Giants QB Eli Manning and the parade that almost was. Bob Varley tells us about Golfing options around Central Florida in his "Send Bob to the Parks" segment. Julie Martin has the latest installment in her Store Tours series - this week she takes us to the Norway Pavilion at Epcot, and Corey and Julie Martin give us a brief history on Mardi Gras and an update on this years Mardi Gras celebration at Universal Orlando. All that plus Roundtable rapid-fire on this week's edition of the DIS Unplugged. (list of top courses in Central Florida). In today’s show we’ll discuss the top news stories on the DIS this week – including a discussion about how the economy is impacting your travel plans and new rumors about a fifth Disney theme park. Kevin Klose has a review for us of Mama Melroses’ Italian restaurant at the Hollywood Studios, and Corey Martin takes one listeners suggestion and will talk to us a bit about resort pools this week – all that plus roundtable rapid-fire on this week's edition of the DIS unplugged. Photos from our listeners Donna and Roger Sauer as they travel to all the Disney parks around the world. In this week's show we'll talk about the top news stories on the DIS including the story about the wrongful death lawsuit against Disney Cruise Line. In her "Store Tours" segment, Julie Martin will take us on a tour of China - and in our forum watch segment, we'll tell you what we're reading on DISBoards.com this week. ALso, we have lots of prize winners to announce this week. All that, plus Roundtable rapid-fire on this edition of the DIS Unplugged. DCL Shore Excursions sold out? Show me a picture - Prove me wrong. What bars do you enjoy? In this week's show we'll talk about the top news stories on the DIS including the final chapter in the battle over low cost housing in Anaheim. Kevin Klose does a comparative review of two Magic Kingdom counter service restaurants - Pinocchio Village Haus and Cosmic Ray's Starlight Cafe. He also gives us an update on a previous review he ad done at Teppan Edo at the Japan pavilion a few months ago, and Pete Werner has his review of the new "Disaster" attraction that just opened at Universal Orlando - all that plus Roundtable rapid-fire on this week's edition of the DIS Unplugged. On this week's show we’ll discuss what’s in the news including the story that might spell big trouble for Sea World. In her ongoing Store Tours series, Julie Martin takes us on a shopping excursion to Germany in Epcot. and in our trip planning 101 segment we’ll discuss the ins and outs of booking a Disney Cruise vacation - all that plus roundtable rapid-fire on this week's edition of the DIS Unplugged. This week we'll discuss the top news stories on the DIS, including the decision by Victoria and Alberts to no longer allow children under 10. Kevin Klose has a review of the Candlelight Processional dinner package, and his dinner at Le Cellier on Christmas Eve. In a new segment this week, we start our Trip Planning 101 series - this week we'll focus on the best time of year to travel, and we'll discuss a variety of hotel options both on and off property. All that plus the longest rapid-fire in DIS Unplugged history (because Bob had to hijack my segment and ramble on incoherently for 20 minutes!!) on this edition of the DIS Unplugged. We discuss some of the changes to Spaceship Earth at Epcot, Corey and Julie had an opportunity to see Cinderella's Caste Suite at the Magic Kingdom, and John Magi has some tips if you need medical attention while vacationing at Walt Disney World.